Does anyone know where? of If I can plug in a turntable?? Horrible in getting their produce fixed. 9 months for the DVD player. The worlds worst souce switching. Sup-par performance. Lack of detail in sound. The worst electronics purchase in my 38 years on this planet. The 510 is a very nice looking amp, but it is UGLY on the inside. Started off with the first 510 power supply dying the first day. Received a replacement from the store immediately. The following years were pretty good. Then just within the past 4 months the death of an amp started. The worst thing possible. A low hum showed up - no matter if anything was playing or not - always a hum. Next the switching started acting up. Play a DVD - input selected to DVD - NOTHING. Choose something else and then go back and finally it would click in. Of course one thing that irked me was the initial playing. The receiver would take its sweat time in playing your source. So you never actually hear the very beginning of - well - anything. So I have let it take a dirt nap. Purchased an Onkyo (less then what I bought the 510 for). And found that the Harmon was horrible. Stay away from the junk. p.s. The 5 disk DVD also had troubles. The store was useless also. I've read some of these reviews to my dismay. I've had only one problem with my receiver which is the volume knob. When I go to turn it up or down it usually goes up and up. The volume is now adjusted only with the remote now. Other than that, I am totally satisfied with the performance and quality. It runs my ns1000's just fine. I'm looking to expand my system and look forward to seeing how much more it will do for me. I think from reading all of the other reviews that at some point Harman Kardon must have had a quality control issue. This condition may still exist. I guess I have been lucky because I have never had a problem with this unit, and I have put it under considerable stress. I have Axiom M80ti's connected to it. They have a lower impedence (4ohms) which pushes the amp much harder. It has never gone into protection mode even after hours of use. I did mount an external fan on top of the unit, which comes on when the unit itself comes on. Even so, I have cranked it up to levels probably not meant for human ears for any length of time and it still works perfect today. I am a little disappointed with the remote. It's ugly and initially it was a little hard to figure out. It does well with movies (especially DTS) also. It is always unfortunate when someone has a bad experience with a product that they expect to perform well. I feel from reading some of these other reviews that I dodged a bullett. Simply does not work despite three trips to the Svce. Center. An update on my AVR 510. I got it back after eight weeks of waiting. It ran fine! for about 10 minutes. Then, Voila, no sound out of the right front speaker. Hook up the ol' Realistic: everything works fine (HK blamed other components in my sound system). I called HK and they said that I should ship it to another "premier" service center in Calif. at my own expense. I have wasted enough time on this garbage. I am getting a Denon reveiver next. As others have said "Went it works and when you have it"
"Went it works and when you have it"
some components could be better no thx certification, is that bad? pioneer, yamaha, marantz, uher reference, technics, denon, bryston. • Aesthetic Appearance • Room to Grow (many inputs/outputs) • Clean & Crisp Sound • Solid and Heavy Construction • Two-year Warranty • Friendly Customer Service—replaced defective remote pronto! • Insensitive tuner, particularly in AM but also in FM. It can't function with factory antenna or amplified store-bought antennas. Requires expensive and LARGE FM/AM antenna to pull in signal. Service center replaced tuner card once, may take it in one more time to obtain service before warranty expires. • More than half the DSPs sound cruddy compared to Yamaha’s DSPs. • Noticeable drop in sound volume/output on 5-channel stereo compared to two-channel. • Must boost KSW 10 sub output decibels very high to hear the results. • Finicky operation: If you start playing a CD/DVD before selecting the right source on the AVR 510, it will not pick up the sound signal. (Remedy: Stop CD/DVD player, select correct source on H/K and then press Play on CD/DVD.) • No Phono Jack • No custom EQs. • Remote can't "learn" on Video 4. • Apparent quality-control issues during the construction of this model and several previous incarnations. The AVR 510 was my first voyage into Hi-Fi stereo and I'm nearly 100 percent satisfied with my purchase. This unit sounds fabulous even when running through small Klipsch speakers! (Long story.) Out of all the fine features the AVR 510 offers, it has one major weakness, IMO. This is a weakness that, as far as I can tell, hasn't been addressed by any of the other reviewers here. The issue: FM/AM tuner sensitivity. Either I have been the victim of defective tuner circuitry OR other reviewers are primarily using their AVR 510s for TV/DVD/CD and haven't reported the problem. Not so with me. For whatever quirky reason, I prefer "live radio," both FM stereo & AM talk radio. Here in the LA area, I have plenty of quality stations to choose from and all are within a reasonable distance from my home so I *should* be hearing them loud and clear. The problem is, I had to go through something like six antennas (both FM & AM) AND a replacement of my tuner card to pull in decent reception. After all this, it's still lacking! The AM/FM tuner seems to be the most overlooked feature of this system. How a AV unit with an MSRP of $1,000 could end up with more static-prone AM tuner than a $4 mini boom box that I purchased as a novelty is beyond me. This is a huge disappointment to say the least! If I had to set up an AV system over again, I may have invested in components that have their own decoders, topped off with a dedicated FM/AM stereo with amp. It seems with all the bells and whistles of today's home theater equipment the basics get neglected. I can now understand why so many die-hard audiophiles recommend buying separate components for each use. This way of building a home theater/stereo setup is more expensive, but it appears to be the best way to go. Plus, if one part of a component system fails you can replace it rather than having all the functions tied into one unit upon which your whole AV setup relies. (When my AVR 510 went to a service center for the tuner issue, I didn't get it back for six weeks—I lost the "heart/brain" of my system whereas having individual components would have left me with some functionality.) Having said this, the H/K line in general still outdoes anything from the likes of Sony, JVC, Panasonic, Pioneer, Sherwood, or Teac. If your budget forces you to invest in an all-in-one AV unit, I’d still recommend the H/K series because it offers a suburb overall sound quality compared to would-be competitors. 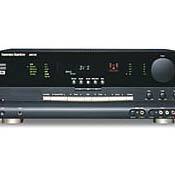 To get anything similar to the H/K in terms of sound quality, you have to go to the very top of the Yamaha, Onkyo or Dennon line, which is fine if you are willing to spend two or three times the price of the H/K to obtain such.